One of the frustrating things for me as I started my sugar-free journey was definitely securing the products I needed in order to make the recipes and ideas that I found. I am not a store-hopper. I don’t like to go to more than one store in a week (with an Amazon order thrown in most weeks!). It goes back to my efficiency-expert-wanna-be ambitions—shopping feels like a waste of time since it takes so much time. Thus, I always appreciate it when recipes have affiliate links! First, I like to support the person who gave me that great substitute for peanut butter pie! 🙂 Secondly, I like to click, order, and have it in two days without going out to several stores and potentially still not finding the right product. Sure, there are some things that I get locally. If I go to Wal-mart, I always get Pyure (though I have a standing order from Amazon for that). If I go to Sam’s, I always get the Carb Balance Mission tortillas. If I go to Kroger, I always get some Lily’s chocolate. But more often than not, I just order what I need at the beginning of the week, and the items are here in plenty of time for my Friday recipe testing. 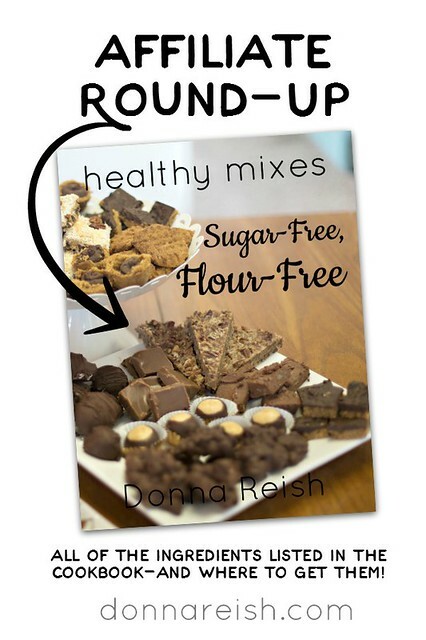 So….here is a convenient list of products that are given in Healthy Mixes: Sugar-Free, Flour-Free with their Amazon links. I hope this is a help to you in your sugar-free, healthy journey! Below are links to the ingredients I use in the recipes in my cookbook. I am an affiliate for Amazon.com. If you click on the links below I will earn a small commission. Thank you for your support of this blog!